Regular listeners to the Religious Studies Project will know that we are not the biggest fans of the World Religions Paradigm. Indeed, it was James Cox’s excellent introduction to the topic back in February 2013, and the accompanying response that asked what Religious Studies should do “After the World Religions Paradigm…?” that prompted David and Chris, with some encouragement from Steve Sutcliffe, Russell McCutcheon and Craig Martin, to co-edit the volume “published in February 2016 with Routledge. Listeners will also be relatively familiar with the concept of “secularism”, “the secular” and so on – particularly from our podcasts with Joseph Blankholm on “Permutations of the Secular” and with Phil Zuckerman and John Shook on “Understanding the Secular“. Today we thought it would be an interesting exercise to weave these two strands together and rhetorically ask “Is Secularism a World Religion?” Discussion starts with the entanglement of the concepts ‘religion’ and ‘secularism’, a brief discussion of the problems associated with the World Religions Paradigm, and then moves to the pedagogical merits and challenges of teaching ‘secularism/s’ within a World Religions model. We hope you enjoy this experiment! You can also download this interview, and subscribe to receive our weekly podcast, on iTunes. If you enjoyed it, please take a moment to rate us. And remember, you can use our Amazon.co.uk, Amazon.com, or Amazon.ca links to support us at no additional cost when buying academic texts, Pulp Fiction memorabilia, astronaut ice cream and more. Christopher R. Cotter (CC): Regular listeners to the Religious Studies Project will know that we’re not the biggest fans of the “World religions” paradigm. Indeed, it was James Cox’s excellent introduction to the topic back in February 2013 and the accompanying response that asked what religious studies should do after the world religions paradigm that prompted David and I, with some encouragement from Steve Sutcliffe, Russell McCutcheon, and Craig Martin, to co-edit the volume ‘After World religions’, published in February 2016. Listeners will also be relatively familiar with concepts of Secularism, the secular, and so on, particularly from podcasts with Joe Blankholm on Permutations of the Secular and with Phil Zuckerman and John Shook on Understanding the Secular. Today we thought it would be an interesting exercise to weave these two strands together and rhetorically ask, ‘is Secularism a world religion?’ So I’m joined today to discuss this question by Donovan Schaefer at the British Association for the Study of Religion’s annual conference at the University of Wolverhampton. Dr Schaefer is departmental lecturer in science and religion, in the Faculty of Theology and Religion at Oxford University and his first book ‘Religious Affects, Animality, Evolution, and Power’ was published in November 2015 by Duke, and has current projects on the relationship between emotion, science, and Secularism. So Donovan, first off welcome to The Religious Studies Project. Donovan Schaefer (DS): Thanks a lot Chris, thanks for having me. (CC): It’s a pleasure. So first of all, in the spirit of rhetorically asking, why are we even asking this question? 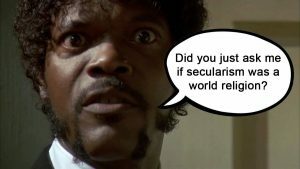 I mean, Secularism is surely as far removed from the category of world religions as we can get, I mean…why are you asking it? (DS): Yeah, definitely. A lot of recent research has actually challenged that seemingly common-sensical argument that Secularism is the opposite of religion. This has come from a lot of different directions, historical analysis, cultural studies, even a lot of work in philosophy of religion has started to challenge this idea that there is a clear line between the secular and the religious. (CC): opposites, you’ve always got the study…the opposites within…you know, you can’t know what religion is without studying it’s supposed opposite anyway. (CC): So, perhaps it would be best to start, I mean, we’ve covered the Secularisation Thesis and a lot of these topics in other podcasts but we should start with that, so let’s paint the context in which this question is being asked then. (DS): Sure, so the Secularisation Thesis really gets off the ground in the 19th Century and it comes from a variety of different quarters in the sort of, early movements in sociology, some of the early conversations that are being asked in science and religion, late 20th Century, sorry, late 19th Century, philosophy of religion, all of these different conversations start to thematise this idea that religion is a specific thing in the world that is gradually going away. (DS): Now, in the 20th century you have thinkers like Max Weber in sociology who formalise this, they make it, they make it even more of a kind of, article of social-scientific faith that religion is on a trajectory of decline. What happens though, is that, later in the 20th Century, you have these historical moments that start to challenge the Secularisation Thesis. So something like the rise of the religious right in the United States in the 1970s in reaction to things like the civil rights movement, or the (05:00) Roe V Wade Supreme Court ruling. The religious right by the mid to late 1970s has become an incredibly powerful force and of course in 1980 you have the election of Ronald Regan with a specifically Christian agenda backing him. Or even across the world, something like the Iranian revolution in 1978 to ’79 that creates a new Islamic Republic where previously there had been a secular state. Stuff like this, it’s just not supposed to happen according to the classical Secularisation narrative. There isn’t supposed to be a return of religion, religion is supposed to be evaporating. And that puts a, it puts pressure on the classical secularisation narrative. So scholars throughout the 1980s, 1990s and up to the present have started to ask questions about the secularisation narrative and have come up with a very robust dialogue about what went wrong with the classical secularisation paradigm and what will replace it. (CC): -it’s not mirroring reality. (CC): So we’ve already alluded to even if these things are dichotomous, obviously it’s studying them alongside each other so…many of us at Universities will be familiar with the standard introductory sort of ‘here’s a survey of world religions’ like ‘Religion 101’ or something. So I think one of the questions you’re really asking is should… where’s the place of the secular in that sort of Religion 101 class? (CC): Is it a World Religion, so if we’re going to segue into that, we’re going to need to talk about what is a world religion first of all, and then ask why we might want to try and fit the secular into that mould. (DS): I mean I should really be asking you that but my take on it is that the idea of World religions again has its emergence in the 19th Century, it comes out of these 19th Century thinkers like Max Muller who are interested in making the study of religion into a science, they want to formalize the study of religion and turn it into something that moves away from the obviously supremacist classification scheme that had been used previously in Western Europe. That said though, Tomoko Masuzawa in her book ‘The Invention of World religions’ is actually…even though she spends a great deal of time sort of researching the archives, trying to find out where this paradigm comes from. Even she ultimately says she doesn’t know where it comes from. It emerges obviously through a sort of confluence of different conversations that are taking place throughout the 19th Century and early 20th century. Where precisely it comes from is…is a little bit opaque. Regardless, what we’re left with by the mid to late 20th Century is an understanding of religions as discrete objects that can be studied in the world that have particular histories, they’re often organised under a particular heading. Buddhism, Hinduism, Christianity, Judaism, and they’re very often structured around a specific text and a specific set of practices. And that structure is something that has become, at least at the level of the dissemination of religious studies in terms of undergraduate teaching, central. (DS): How did I do? (CC): –that idea of a text and it being about belief, you can only have one faith and all that sort of thing. This seemingly objective model sort of becomes Oh…that’s a little bit Protestant. (DS): Definitely. And also something that I think we can see as being a by-product of (10:00) a particular idiom of 19th Century science. 19th Century science it’s the age of classification, it’s the age of grand theories, and that prison divides up the world in a particular way, and I think we can see the World religions paradigm as being a product of that particular way of thinking about the world. (CC): Mmm. And that particular way of thinking about the world is deeply connected with Colonialism as well. (CC): We were encountering others and then classifying them. (CC): ‘Classify and conquer’ was, I think was Max Muller’s term. And then of course it encourages this notion that there is a thing called religion that is made manifest in various forms. (CC): So Russ McCutcheon would take great issue with that. (CC): So given all that problem with the World religions paradigm why would we want to try and fit Secularism into that model. What would be the point, shouldn’t we just be jettisoning it? (DS): Yeah, right. Well, I mean, I have a few thoughts on that. I am not…I’m not blanketly hostile to the World religions paradigm. I think that …I would give it about a six out of ten or a seven out of ten in terms of a pedagogical tool for explaining religion to undergraduates, especially if we start from the assumption that many undergraduates are only going to take one religious studies class. Is the World religions paradigm the best way of doing that? I’m not sure. But I don’t think that it necessarily is evil. However, I do think that it needs to be deconstructed from within. I think that precisely as we’re teaching students within this framework we need to be calling attention to the limitations of this framework. And part of the reason why I think it’s important to talk about Secularism within that context is because I think that it sets the stage for conversation about the World religions paradigm in and of itself. (CC): Okay, so… let’s do this then. Let’s take the World religions model and let’s take the notion of Secularism. So how are we going to go about answering the question is it a world religion? (DS): Definitely. So this is where I want to get a conversation started. I don’t have clear answers to this but what I sort of see us doing is shuffling the deck of Secularism studies into the deck of the World religions paradigm and just seeing what comes out on the other end. So I think that, in terms of a kind of structure, an overall architecture to this, there would be two ways of doing it. So Secularism studies scholars have roughly speaking two ways of talking about Secularism. One of the ways of talking about it is to say that Secularism is itself a particular iteration of Protestant Christianity, that we have the version of Secularism that we have because we are an offshoot of a cultural historical context that defined religion in a particular way. This goes back to something you were saying earlier about the inextricability of the category of religion from the category of the secular. It’s precisely because we see religion as something that is potentially private, individualised, and belief orientated that religion is something that can be relegated to the private sphere and therefore… and therefore secularised, according to the conventional definition. (DS): Yeah, absolutely. Or even like, one thing that historians and especially intellectual historians like Jonathan Z. Smith, Talal Asad, when he’s wearing that hat, or someone like Craig Calhoun, they really liked to emphasize the beginning of modernity and the immediate aftermath of the Protestant reformation. (DS): So you could look at it theoretically in the way that religion gets defined as something that is personal rather than corporate. (15:00) You could look at it historically and the way that the resolution to the wars of religion that emerge in the aftermath of the reformation. The political…the political compromises that are made in that wake tend to make religion into something that is detachable, it’s something that is sort of, as Locke puts it, can be kept in the private sphere rather than the public sphere. All of these…all of these…all of these details of Protestantism, whether they’re sort of, part of the DNA of Protestantism or whether they’re sort of historical accidents that shoot off from Protestantism, they make up the coordinates of what would eventually become Secularism. (DS): So one of the ways that I could see us potentially integrating Secularism into the World religions classroom would be to talk about it as an offshoot from Christianity. (DS): When we teach Christianity we teach Secularism as something that Christianity does in exactly the same way as you know, depending on how many days you have for teaching Christianity, you would give a sort of capsule history where you would talk about the great schisms, orthodoxy from Catholicism, Protestantism from Catholicism and then could also locate Secularism as, in a sense, another schism, as another permutation of Christianity that is part of the story of Christianity as a World Religion. (CC): –because people don’t feel annoyance unless there’s some sort of deep connection to the category that you’re talking about. (DS): I think that’s right and especially building on that if we’re talking about teaching students in a Western/Anglo/Euro/American context, we’re going to be teaching students who are going to be coming from a variety of faith positions some of whom will be coming from a non-faith position and probably see their status as mutual. They probably see the religions they’re looking at as in a sense, under glass, as something that is disconnected from where they are. And I think it’s important for those students to recognise that even the liberal Secular idiom that they might see themselves located within, has a history. That it, even it, the agenda of that is set by a particular set of Christian coordinates. Saba Mahmood has done some really excellent work on this, talking about the way that these sort of ostensibly secular legal codes throughout Europe actually privilege a kind of ghost of Christianity, that they are marshalled in the service of defending a sort of Christian heritage and they suppress other ways of being religious. (DS): -that’s been happening in the summer of 2016 where Burkinis, this article of clothing that seems like it would be inoffensive enough has actually become offensive to French Secularism. Precisely because it is encoding a set of Christian presuppositions about ways that you are Secular and religious. (CC): On that note I saw that, it was in the Guardian, they were quoting sort of, the ruling and it said it might offend the people’s (non) religious (non) convictions. (CC): So your non-religious non-conviction might be offended by it, there’s something interesting going on there. (DS): Exactly. I think that that’s exactly…I think that that’s a really important pedagogical manoeuvre with students is showing them how even our own liberal democratic structures have a sort of conserved Christian genetic coding in them. That’s not to create an equivalence, that’s not to say that the difference aren’t meaningful, it’s just to say that we need to…we need to take a critical eye on our own intellectual inheritance rather than presupposing it’s neutral. So all of that would be one way that I would see Secularism entering the World religions paradigm… structure. I think there’s another way though, which would be equally interesting. (DS): So one of the ways that scholars working in the mode of critical Secularism studies have approached Secularism is to say there is not just one Secularism. (DS): There are in fact multiple Secularisms. This is the title of a book, an anthology (20:00) by Janet Jakobsen and Anne Pellegrini, ‘Secularisms’, and this, as I see it, is coming out of these two sort of, kind of, guiding lights of the critical Secularism studies field. Talal Asad and Charles Taylor. So Talal Asad is very interested in this idea that the Secularism that we have is a result of a particular history and he says that rather than assuming that Secularism is going to be the same everywhere we anticipate a multiplicity of what he calls ‘formations of the Secular’. (DS): There are different Secularisms that correspond to different historical moments, and they have different priorities, they have different coordinates, they have different outcomes precisely because their starting points, the sort of ingredients out of, the landscape out of which they secularise is different. So his sort of cardinal example of this is the difference between Christianity, especially Protestant Christianity and Islam. Protestant Christianity de-ritualises religion so its version of Secularism is a version of Secularism that doesn’t pay a lot of attention to ritual, doesn’t pay a lot of attention to practices. Asad will say, you know, when we have formations of the secular emerging out of Islamic contexts we need to be attentive to the way that they are…that they are…that they always keep an eye on practices. And the version, the formations of the Secular that emerge in these other contexts will have a different configuration. Charles Taylor calls this…he calls this ‘the myth of the subtraction story’. The myth of the subtraction story is this idea that once you get rid of religion, you’re left with a neutral landscape. (CC):- you would teach Christianity and Christian Secularism, Islam and Islamic Secularism. (DS): -you know like, okay, you’ve got, you’ve got your five pillars, you’ve got Islam. That’s not actually adequate, that’s never been adequate for teaching what religion is, but it’s particularly inadequate in the context of a situation, a global situation now, of accelerating mediatisation and globalisation where transactions between different traditions are becoming more and more…more and more rich. They’re just more and more…the dynamic between different traditions is becoming deeper and deeper. And I think that emphasising that localism of Secularism would be a way of raising that to the surface. (CC): Mhhm. And this is exactly the sort of thing that we should be discussing at this conference, the theme being ‘religion beyond the textbook’. (CC): So, conclusion then. So, are you going to do this? (DS): Yeah, I think I will. I’m not in a situation right now where I teach world religions but as I think about, as I think about that syllabus next time that that portfolio falls into my lap it’s something that I’m actually quite excited to do, precisely because of the way that I think (25:00) it, it reciprocally calls attention to the limits of both the world religions paradigm, which I think is a useful, if limited, pedagogical tool, and the Secularisation narrative. (DS): Yeah. I think all discourses have dangers. All discourses are going to be provisional ways of organising the abundance of information that is the world. And they’re always going to have certain limitations attached to them. I think that the best that we can do is inhabit those discourses with a sort of deconstructive eye. And my hope is that among other things I think that there are lots of ways of sort of reciprocally critiquing the world religions paradigm while teaching it. I’ve tried to do that in the past when I’ve taught world religions. I think that this method of introducing Secularism as a legitimate object of study within the architecture of the religions, world religions paradigm could be a way of amplifying that technique. (CC): –is Secularism a world religion, set it as an essay topic or something, I can see some really excellent discussions happening there. (DS): That would be fascinating. I mean, I think too, like, I absolutely agree with what you’re saying, that pedagogically that, I mean, there’s only so much we can do to sort of…there’s only so much we can do to sort of destabilise the way that students think, but I’m also…I’m also a firm believer in the pedagogical value of inhabiting something from the inside in order to destabilise it. (DS): Rather than standing so far outside of it that students can’t necessarily see what you’re doing. (DS): And my hope is, and again I mean, this is just an optimism, it’s not something that I’ve actually put into play, and really I see it more of just a conversation starter in pedagogy circles than anything, and my hope is that this practice of introducing Secularism as an object of study within the context of the world religions paradigm would be a way of inhabiting that paradigm from the inside and leaving students with a very vivid impression of its own limitations. (CC): That is a wonderful way to end. Bang on half an hour, so thanks so much Donovan. (DS): Thanks so much Chris, this was wonderful. (CC): Well, I very much enjoyed recording that interview with Donovan and we both were in the session where he presented that paper at the BASR. (CC): He didn’t attack our argument! (DR): I thought it was wonderful, I loved every minute of it [laughs]. (CC): But yeah, it was one of those lovely moments that was sort of the first proper one in my “career” in quotation marks. And so hopefully the catchy title there will have dragged in some listeners, you might have thought ‘what, what, that’s ridiculous!’ But hearing Donovan talk about it as an interesting thought experiment, as a way of dismantling in a way the hegemony of the paradigm itself. (DR): Indeed, and problematizing the term and its application and the rest of it, and Chris and I have talked about an After After World Religions, be it a journal or a second volume of the book, and Donovan is going to contribute to that (30:00) hopefully, if and when it happens. (CC): You hear that Donovan? You’re under contract now. (DR): He gave me a verbal agreement and in Scotland that’s legally binding. It was in Helsinki. (CC): And in Wolverhampton. Same difference. (DR): Oh. Either way, I’m Scottish so that’s binding. (DR): I think we may be showing too much of the man behind the curtain this week. https://i2.wp.com/www.religiousstudiesproject.com/wp-content/uploads/2016/11/Donovan-Schaeffer-320x320.jpg?fit=320%2C320&ssl=1 320 320 Thomas Coleman III https://www.religiousstudiesproject.com/wp-content/uploads/2018/08/logo.png Thomas Coleman III2016-11-28 10:00:512018-07-26 12:33:01Is Secularism a World Religion? Excuse me, can you please give me a text about this podcast? Some of the words I can’t listening clear, thanks very much. Thanks very much for your help, hope you working successfully. Researching Radicalisation Sociology of Religion – and Religious Studies?